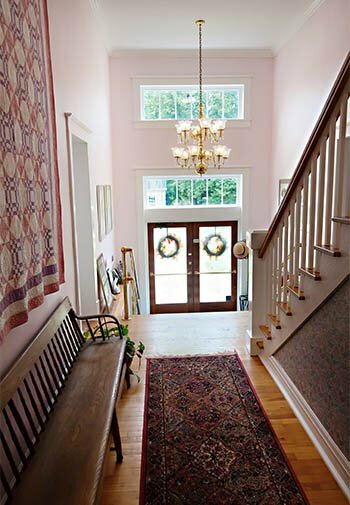 Welcome to our School House Bed & Breakfast Properties in Rocheport Missouri! 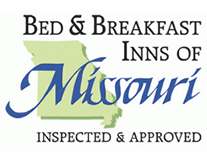 Our Rocheport bed and breakfast in the heart of Central Missouri and midway between St Louis and Kansas City, is a short drive for your overnight getaway! And the quaint town of Rocheport (pop. 239) offers fine dining, our local Les Bourgeois Winery, the scenic Katy Trail State Park and antique and artisan shops. Experience unique lodging choices tailored to your traveling needs at our School House Bed & Breakfast, Clark Street Lodge and Dormitory House. You are sure to enjoy the atmosphere of each property as well as the attractions of Rocheport and nearby Columbia and Boonville, MO. Whether you’re planning a romantic getaway, a Katy Trail cycling trip or a girlfriend getaway, one of our properties is a great fit for you. And we also offer weekday business retreat packages for your management team. The original School House Bed & Breakfast is in a wonderfully restored 3-story brick building on the National Register of Historic Places. 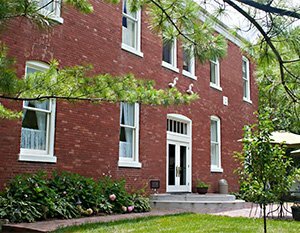 Originally serving as Rocheport’s public school, the building was converted to an elegant bed and breakfast with eleven beautifully appointed guest rooms. While having all the modern conveniences that travelers desire, the inn retains the history and charm of its past life. 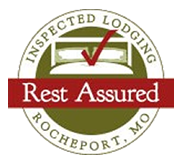 It’s the perfect starting point for your relaxing Rocheport bed and breakfast experience. 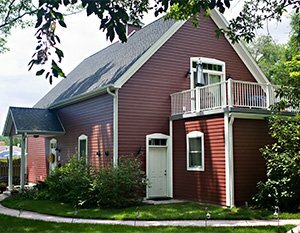 Our Clark Street Lodge, located just east of the School House building, offers self-service lodging with two apartment-style units ideal for small groups such as girlfriend getaways, cycling groups and families. 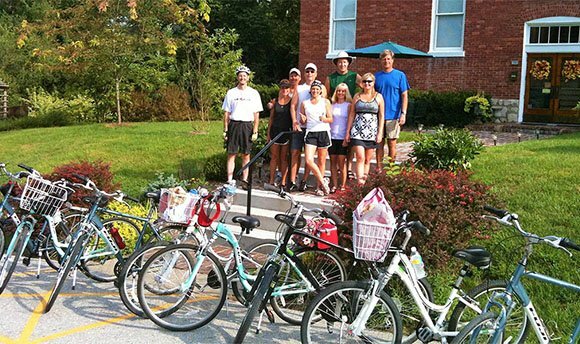 Our Dormitory House, located just west of the School House building, offers self-service lodging with two private guest rooms with private baths and multiple beds designed for budget Katy Trail cyclists. None of our 3 small lodging properties are fully ADA compliant, but we make every effort to accommodate guests with physical limitations. Please call us with your specific needs. The School House Inn building, listed on the National Register of Historic Places, has steps required to enter the building and a 23-step staircase to the second floor Common Room (no elevator) where guest breakfast is served. However, for Inn guests with difficulty climbing the staircase, we can serve an in-room breakfast tray to a first floor guest room. Inn room bathrooms are not fully wheelchair accessible. 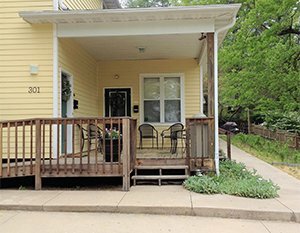 Our Clark Street Lodge building does have a ramp to the entry porch and its first floor Cottage unit has 36” doorways; however, the bathroom and kitchen facilities are not fully wheelchair accessible. Both guest rooms in the Dormitory House are on the first floor with only two steps required to enter the building; however bathrooms are not wheelchair accessible. The School House and the town of Rocheport are ‘high and dry’ and all Rocheport businesses are open their regular hours. The only thing in Rocheport that can be temporarily affected by Missouri River water levels is a 3 mile section of the Katy Trail starting just west of the Rocheport tunnel where the Diana Bend Wetlands Conservation area lives up to its name and oozes water over the trail when the Missouri River level reaches 26.1 feet as measured by the ‘Boonville Gauge‘. When the trail closure happens, there is a highway detour (about 4 miles) available using US Highway 40 and the 240 Spur leading in/out of Rocheport. 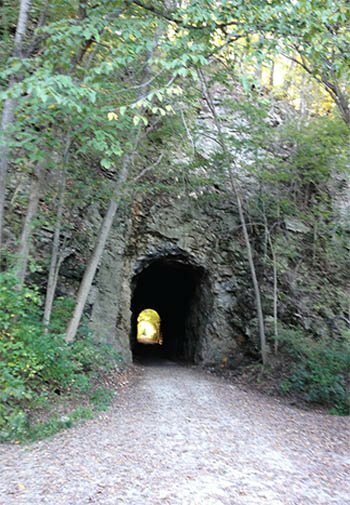 As of Friday, April 5th, this 3-mile section of the trail is OPEN again. You should check these resources frequently as they are updated as projections change. Enjoy weekday rates on Fridays and Saturdays ($40 savings per night) in March and April for any Inn room. Just select the Spring Break Weekend Special rate button under Special Rates on the online reservation form. We have a limited number of trail bikes/helmets available for Inn guests to rent during cycling season (Spring Break through mid-November). The rate is $30 per day, including tax. You can easily add bike rental to your online room reservation. And for 2-night stays, please see our Katy Trail Adventure Package on our Specials page. Planning to tour Warm Springs Ranch, home of the Clydesdales? It is just 10 minutes from Rocheport, but you need to book your tour tickets well in advance. Tours are offered daily, 10am and 2pm, except Tuesdays, April through October. Click here for their website and online ticket purchases. Redeeming Your School House Gift Certificate? The School House Bed & Breakfast accepts only School House issued gift certificates. To redeem your certificate on a room reservation, please provide the certificate number in the “Special Accommodations” box on the online form OR call with your certificate in hand so we can get the complete information. If we are not notified of your gift certificate details at the time you book your reservation, you will incur a 3% handling fee for the amount of the credit card deposit refunded. Guests: May through October, Abigail’s restaurant serves dinner Wednesday through Sunday evenings by reservation only. Please call them at least a week in advance of your arrival date to make reservations at (573) 698-3000. Lunch with sandwiches, salads, soups, etc. will be available Wednesday through Saturday. Lunch on Sunday is by reservation only. Winter hours will vary. The Les Bourgeois Bistro serves lunch and dinner Wednesday through Sunday during season. Winter hours will vary. You may make reservations online through Open Table or by calling (573) 698-2300. Please note: The Bistro restaurant may be closed or have special hours due to weddings, events, holidays, etc. so please check their availability in advance. Their outdoor A-frame Winegarden on the bluff top is open daily from Noon to sunset April through October, serving sandwiches, snacks and of course…wine by the glass or the bottle. When planning your Katy Trail trip, we recommend checking BikeKatyTrail.com for trailhead services, mileage and user comments for helpful information. MoStateParks.com also posts current trail conditions and advisories. And check out our Blog page for Current Events happening at the School House and the Rocheport area. Looking for the Best Rates in Rocheport? Book online for best rates at all our properties!